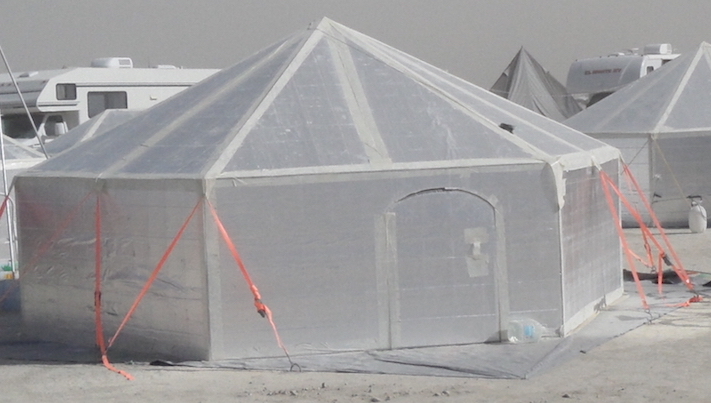 JAB Ventures provides storage to Burning Man attendees from year-to-year under it’s BRYST brand (acronym for “Black Rock Yurt Storage Trailer”). Our customers drop off their yurt in our trailer on-Playa, and retrieve it from there the following year. 2018 (to 2019) reservations are now open! More information here. Follow us on Facebook, and read our BRYST Blog. Need(s) to be transported to & from the Playa. Even when folded up, they are pretty big – a brick that is 4′ x 8′ by 18-24″ thick. Put that on the top of a car or bus, and it acts like a sail, reducing gas mileage, and being otherwise not-very-eco-friendly. Moop the highway. If not properly wrapped & fastened, bits of yurt can go flying off the top whilst driving. Just because you’re not mooping the Playa doesn’t remove the need to Leave No Trace. The highway counts, too. Charges for storage, but does not aim to make this a significant profit-making activity. We cover costs, and put a little aside for growth. There are thousands of Yurts on the Playa. It’s our goal to eventually provide storage trailers for nearly all of them. (Only the people who want to work on them between burns should take yurts home). Use the form below if you have any additional questions.